18 free concerts on the Newburgh waterfront every Wednesday and Thursday during July and August. All shows are free and open to the general public. Attendees must bring a chair or blanket. The concerts consist of traditional jazz, fusion, big band jazz, blues and funky jazz. The event was sited by the NYC Daily News as “ #5 of top 10 things to do in the Hudson Valley. Nov. 24 (Bloomberg) -- Apple Inc. said digital downloads of Beatles songs and albums rank among the top sellers on its iTunes online media store after going on sale last week. Customers purchased 450,000 albums and 2 million songs since the group’s music became available Nov. 16 on iTunes, Tom Neumayr, a spokesman for Cupertino, California-based Apple, said today. Apple began offering Beatles songs through iTunes on Nov. 16, ending an almost decade-long stalemate with the best-selling group. Albums are priced at $12.99 and individual tracks cost $1.29. A $149 set of all Beatles albums, including greatest hits compilations, a documentary and 1964 concert video, ranks No. 33 on iTunes. “Abbey Road,” originally released in 1969, is the ninth- most downloaded album on iTunes, according to a ranking posted at Apple’s website. “Here Comes the Sun” is the band’s biggest-selling track, ranking No. 56 on the iTunes chart. The absence of the Beatles has been the highest-profile hole in the catalog of Apple Chief Executive Officer Steve Jobs’s digital store. The band had kept its focus on albums, tapes and then compact discs, even as a decline in CD sales sent artists to the Web. Formed about 50 years ago, the Beatles have remained a top-seller, with customers buying more than 30 million albums in the last decade, according to Nielsen SoundScan. Apple’s iTunes is the exclusive digital retailer of Beatles music into 2011, London-based EMI Group Ltd., the band’s record company, said last week without providing specific dates. Apple may spark digital download sales, which slowed as a result of less spending by consumers ages 35 and older, Russ Crupnick, an analyst at NPD Group Inc., said last week. Ownership of the Beatle’s music catalog rests with various parties, including surviving band members Paul McCartney and Ringo Starr, as well as Yoko Onoand Olivia Harrison, the widows of John Lennon and George Harrison. EMI, Sony Corp. and the estate of Michael Jackson control some rights. Copyrights for some of the Beatles earliest songs will begin expiring at the end of 2012, 50 years after “Love Me Do” was released. Apple, the maker of Macintosh computers and iPod media players, rose $6.07, or 2 percent, to $314.80 at 4:29 p.m. New York time in Nasdaq Stock Market trading. The shares have climbed 49 percent this year. Closely held EMI is controlled by Terra Firma Capital Partners Ltd.
Bob Dylan performs on the first night of his American tour at The Backyard this past summer. Seeing Bob Dylan play live these days is like watching an outlaw hide in plain sight. He's a virtual fixture on the concert scene, turning up every year as part of his "Never Ending Tour." Yet, onstage he seems mainly remote - mumbling little, if anything, to the crowd and offering no gestures that can be easily read. Likewise, he's genial enough to play lots of hits everyone knows. But he delivers them in versions that can bear as much resemblance to the originals as an aging Hollywood wife's worked-over face does to her natural one. Dylan proved mainly true to form Monday night as he kicked off a three-night stand at the 2,900-capacity midtown club, Terminal 5. He didn't speak a word until he introduced his band at the end, and, for much of the one hour and fifty minute show, he remained at the side of the stage, plunking the keyboards. As usual, Dylan, 69, reinterpreted much of his material wildly enough to engage listeners in the world's trickiest game of "Name That Tune." "Tangled Up in Blue" became as much a soliloquy as a song, one matched to a staggered new rhythm. "Just Like Tom Thumb's Blues" received a punched-up melody, elaborated by a guitar solo from lead player Charlie Sexton you could almost call suave. The band's run at "Desolation Row" sounded nearly sprightly, adding a new strangeness while giving a fresh inflection to its old sarcasm. Dylan opened the night with something of a wild card, the rarely played "Gonna Change My Way Of Thinking" from "Slow Train Coming." Its lyrical vow of constant reinvention could serve as the icon's most enduring mantra. He added an equally graceful, and new arrangement to "Shooting Star," from his most under-rated work, 1989's "Oh Mercy." Of course, Dylan's vocals remain freakish wonders. He's so hoarse these days, he makesTom Waits sound like Julie Andrews. And his phrasing just keeps getting more fitful and bizarre. Then again, those things also give him an on-going edge. 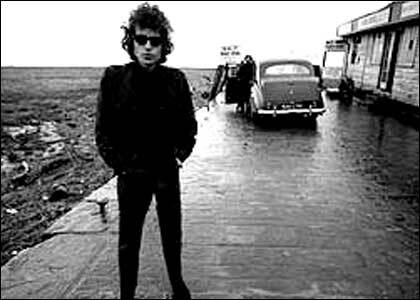 Though much of the show Dylan stressed coiled blues, including, archetypically, "Highway 61 Revisited." Here and elsewhere Dylan played more organ solos than he has on recent tours. He also went back to guitar for about a quarter of the show, a change from recent stints where he left the six-strings entirely to others. Dylan's latest band has a flinty, easy-going charm, highlighted by Sexton's jagged leads. But it lacks the fire and thrills of his groups from the '90s, featuring the lightning-fingeredLarry Campbell. "Cold Irons Bound" arose as one of the few numbers last night to bring out genuine intensity in the band. While Dylan's demeanor added to the distance, it had its own mystery. Lit in jaundiced yellow, Dylan appeared like a character out of his own David Lynch movie. If the particular performance he gave proved far from one of his recent best, at least it served to remind us that any Dylan experience has a singular allure. Bob Dylan is a towering figure of late 20th century pop music, known for such songs as "All Along The Watchtower" (made into a hit by Jimi Hendrix), "Like a Rolling Stone," "Tangled Up in Blue," "The Times They Are A-Changin'" and "Lay Lady Lay." Dylan has been recording and performing since 1962, mixing folk, country, blues and rock; he sometimes startles his fans but almost always pleases the critics.